By Sadiq Umar – The Special anti-terrorism Airforce team code named Air Task Force (ATF) has destroyed a Boko Haram terrorist hideout at a settlement known as Bakassi near Daban Masara on the fringes of Lake Chad in the Northern part of Borno State. Similarly, the ATF which is the air component of Operation Lafiya Dole, in close coordination with troops of 145 Battalion Nigerian Army (NA), also repelled the insurgent’s attack at Gashigar. Director of Public Relations and Information, Ibikunle Daramola, an Air Commodore said in a statement Thursday. The attack at Bakassi was carried out following days of Intelligence Surveillance and Reconnaissance (ISR) missions that led to the identification of a group of buildings and makeshift shelters in the settlement that were being used by the terrorists as Tactical Headquarters from where they launch attacks against own troops’ positions. “Accordingly, the location was attacked by a Nigerian Air Force (NAF) Alpha Jet aircraft leading to damage of some of the structures and neutralization of several terrorists. Similarly, the ATF said it “received intelligence reports that a group of Boko Haram terrorists in several gun trucks and on motorcycles were advancing for an attack on own troops position at Gashigar. “Consequently, a fighter jet and helicopter gunship, supported by an ISR platform, were scrambled to the location. The aircraft, in coordination with the ground troops, intercepted and destroyed some of the gun trucks and motorcycles while neutralizing some terrorists at the outskirts of the town. 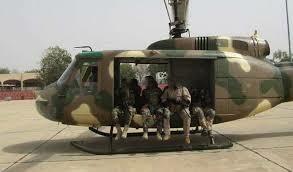 “The helicopter gunship subsequently carried out several follow-up attacks passes and continued to engage the remaining fleeing terrorists,” Mr. Daramola further said. “The NAF, working in concert with surface forces, will sustain the momentum of operations with a view to destroying vestiges of the insurgents in the fringes of Lake Chad and other areas in Northern Borno,” the statement added.